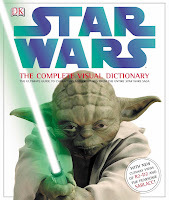 Believe or not the library has 423 entries in our catalogue for the Star Wars series. If there ever was an original movie that is more comic book worthy than this, I am not sure what it is. I wanted to point this out because May 4th is Free Comic Books Day and our AlderneyGate Library is a participant. I cannot imagine anyone not having heard of the George Lucas Star Wars franchise. This American space epic began in May 1977 with the release of the first film, Star Wars. Since then there have been six other feature films. Lucas' feat of imagination has expanded to include comic books, novels, non-fiction books, video games, board games, television series, figurines and many other items that I am sure I have over looked. Taking place in a “galaxy far, far away”, the themes featured are typically science fiction and fantasy; there is space travel of course. There are knights, princesses, humans, robots, and alien creatures that often have human characteristics and flaws. Weapons similar to guns are used but the light saber swords are used by the Galactic Empire. One of the major themes (and quotes) is “May the force be with you”; thus my bad pun above. The force is an omnipresent energy that can be used by those with the ability. It is described as “an energy field created by all living things that surround us, penetrates us and binds the galaxy together.” The force can be used for supernatural feats such as mind control and telekinesis. The six films feature the Jedi, who use the force for good, and the Sith, who use its dark side to try to take over the galaxy. Disney recently purchased the franchise and has stated that it will release a film a year! George Lucas has kept the artistic control to what is known as the Expanded Universe, which is the term used for official licensed Star Wars materials outside of the films. This material can expand on the universe and taking place anywhere from 25,000 years before The Phantom Menace to 140 years after The Return of the Jedi. Lucas ensures that there is a continuity between the various authors. Believe me this is needed as there are numerous of authors and creators involved in expanding this financially successful enterprise. Star-Wars based fiction actually pre-dates the film’s release. George Lucas is credited as writing the novelization of the movie but it was actually ghostwritten by Alan Dean Foster. Since then Lucas has even created the publishing company of LucasBooks. As I have mentioned above there are 423 entries for this series, 9 of which were published in 2013 – so far! So go out there and travel to that galaxy far, far away – at least in your imagination!